For some reason, our conversation turned to running. Debbie wants to run a marathon in two months, but she doesn't feel ready. “Have you run a marathon before?” she asked. I told Debbie about my friend Mike. Mike is a software engineer who is happy in his high-paying job. All the same, once or twice each year he takes time off work to interview with other companies. He's not actively seeking to leave his job, but he wants to stay sharp. He wants to see what other opportunities are out there. He wants to get practice interviewing. Obviously, Debbie is in a different situation, but I think she can apply the same principles: Actively apply for other work. View the experience as an exercise, not a necessity. When she doesn't get a job, she should follow up to find out why not. Ultimately, I didn't have any magic answers that could make Debbie's money problems disappear overnight. As is often the case, she's going to have to do a lot of hard work (and make some sacrifices) in order to improve her financial situation. She's going to have to avoid falling into the forever fallacy, the mistaken belief that she'll always be struggling at a job she hates while carrying a mountain of debt. Things will be tough for a while — but if she can make some course corrections, they'll improve. “Thanks for meeting me,” Debbie said as we left the restaurant. “I hope it helped,” I said. I'm never convinced that these conversations are actually useful for the people I meet. Like I said, I too lack self-confidence. My dinner with Debbie reminded me of a conversation I had last year with my friends Wally and Jodie. As I shared last August, this couple has decided to take control of their finances, but they started with less than zero. In fact, their situation is very similar to Debbie's. When I wrote about Wally and Jodie in August, their income and spending were qual. They couldn't save anything. They had $35,000 in debt and were behind on a car payment. I don't know their exact situation today, but I know they've been working together to increase their saving rate. They don't go out to eat. They don't drink alcohol. They work constantly at multiple jobs. I love hearing success stories like this. I love seeing people taking action to turn their lives around. I believe strongly that Debbie can turn her life around too. She's young. She's smart. She's engaging. She lacks self-confidence, but that can be faked. If Debbie is willing to make a couple of big moves — reduce her rent and find a new job — I suspect that in six months or a year that she too will find that she has a gap between what she earns and what she spends. And when she creates this gap, her worries will diminish. (They'll never go away, but they'll decline.) In time, she will pay off her student loans, find work that she loves, and change the world. 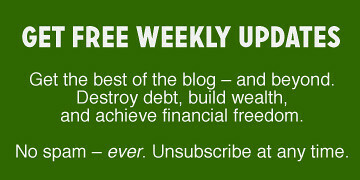 There are 16 reader responses to "Case study: Deep in debt but scared to take action". Thanks, Sara. Things are complicated. People are complicated. That’s what makes these meetings so tough sometimes. It’s easy to sit here at a computer and say: You should have purpose, spend less than you earn, and things will turn out great. Real life is more complicated. It’s messy. I strongly believe that the ideas I espouse are applicable to everyone (or nearly everyone). But what does that actually mean? How does that apply to real life? Well, that’s sometimes tough to figure out. I think you need to bring case studies like these to your blog more. I read a lot of money blogs and most are full of success stories. Money blogs need to pull in the people who need hope and help. unfortunately , the people who need it most, even when you lead them to great Ideas , still don’t take charge of their money problems. It’s a mystery to me how someone can say, ” yeah yeah your right , I’m gonna do this.” Then, later , you follow up with how ya doing? And get, “yeah but, yeah but.” Its sad to see people that know what they should do , but don’t. CAUSE ITS TOO HARD… when reality is they just didn’t give it a try and find out it wasn’t so hard. keep up the great work JD and Kim, we need you around !! What stands out to me about this conversation is what you shared about approaching the marathon with a sense of fun. You could’ve gotten really self-conscious and chosen not to participate, but instead you embraced the experience and didn’t take yourself too seriously. I’ve had to do this a lot lately, because we’re aggressively paying off our debt and I’m pursuing work that I care about. I’m really putting my true self out there, and the superficial things that made me blend in, like nice clothes, a regular car and normal weekend activities to chat about, aren’t there as a buffer anymore. What’s kept me on track is being open & having fun with it, instead of taking myself too seriously. I think that’s a great thing to remember to do, when fear comes knocking. 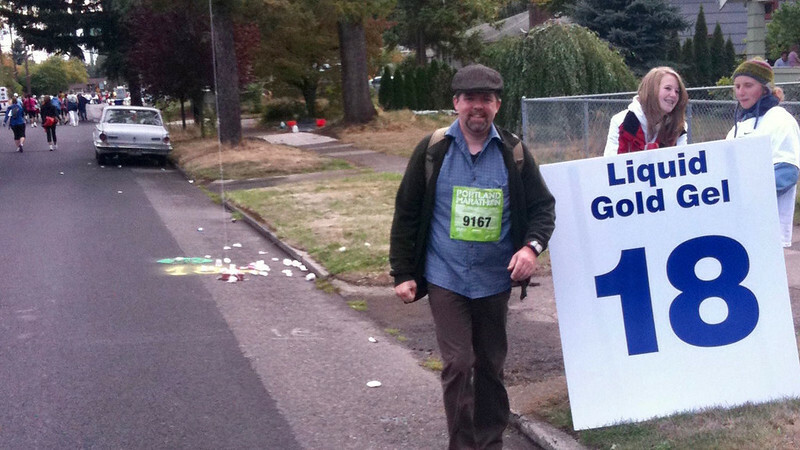 I noticed in the photo of you walking the marathon that people in the background were going in the opposite direction. Did you walk it in reverse? Haha. I noticed that this morning too, and I wondered the same thing. I think the real answer here is that I turned around and walked toward my photographer. Based on the placement of the mile marker, it must be facing the participants. I think I wanted my face in the photo, so turned around for a moment. I loved this post and think case studies like this would be a great regular feature. I appreciate how genuinely empathetic you were to Debbie (and also the details about what you were eating and drinking! ), and the way you shared your struggles with her–and us. I do hope she reads Ramsey’s Total Money Makeover. All the caveats about Ramsey aside, that book is probably one of the most useful books for Americans. I was not in debt, but I found it inspiring nonetheless. This is a great post and it’s come just at the same time that I’m starting to get our family clear of debt and save more. I don’t know why it’s comforting to know that there are other people in a similar situation, it shouldn’t be should it? It’s not like I get some weird pleasure from knowing other people are in debt too but maybe it’s that it then gives me the encouragement and inspiration to look at people who’ve been in the same boat as me and with some planning and commitment got themselves to a better financial place. Thanks again for the timely boost! I think it’s great that you’re helping people on a 1 to 1 basis. Great job. Action really is the way out. Most of us already know what to do, but we just don’t. We have to build better habits to get out of the rut. I hope you exercise more this year. Build it into your schedule and stick to it. Good luck! Thank you for posting the case study! It feels so real and refreshing. I think most people know in general what to do but the difficult thing is to apply the principles to individual situations and to take action. I hope you have a follow-up post about Debbie in the future. I think we can all relate to this. Knowing what you need to do and facing up to reality and actually doing it are two entirely different things. They mistakenly say that “knowledge is power”, but the only knowledge combined with deliberate action is truly empowering. That was a painful read. Not your writing of course, but Debbie’s questions and answers. >>Ultimately, I didn’t have any magic answers that could make Debbie’s money problems disappear overnight. Actually, you did. Her rent is insane for her income, yet you see people making the same choice over and over. It really is as easy as getting one or two roommates. And she needs to find a 2nd job to pay off her student loans and/or find another higher paying job. That $600/month loan deferment made me ill to read. She is living in fantasy land, ignoring her reality. What will probably happen? She will probably marry someone with the same amount of student loans, double their income, move into a $2400/month home/apartment, and still wonder why they are still in debt. Then they will be the ones in their 50’s saying “we both work two jobs, and can’t get ahead”. No sh-kidding! You BETTER make better choices when you’re young, or you’re going to find yourself in a heap of trouble later in life. Another vote for the case studies. Some readers will see themselves in these articles; others will see the people they USED to be. Either way, it’s a good deal. Love the “practice” job hunt- that’s how I ended up in my current job, which I really really dig. I applied as a practice run to force myself to update my resume, and with the goal of a second interview marking a success. Well, 2nd interview went well, had a 3rd with a local team, learned more about the company, liked what I heard, and got an offer I couldn’t refuse. I’ve been really encouraging friends now who are kinda looking or sorta pondering a change to just go for it, apply for jobs even if it’s not your first choice or out of your league- get the resume polished. When the big time interview comes along you’ll have practiced and you’ll nail it.